Looking to add visual interest to your kitchen? A great way to do so is to do something we call “two-toning” your cabinets. 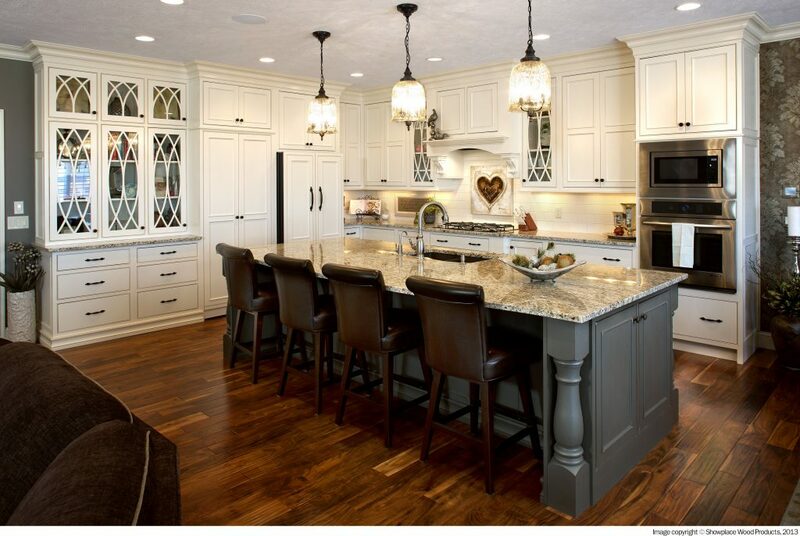 Two-toning is simply incorporating two different and contrasting finishes of cabinetry that work well together. 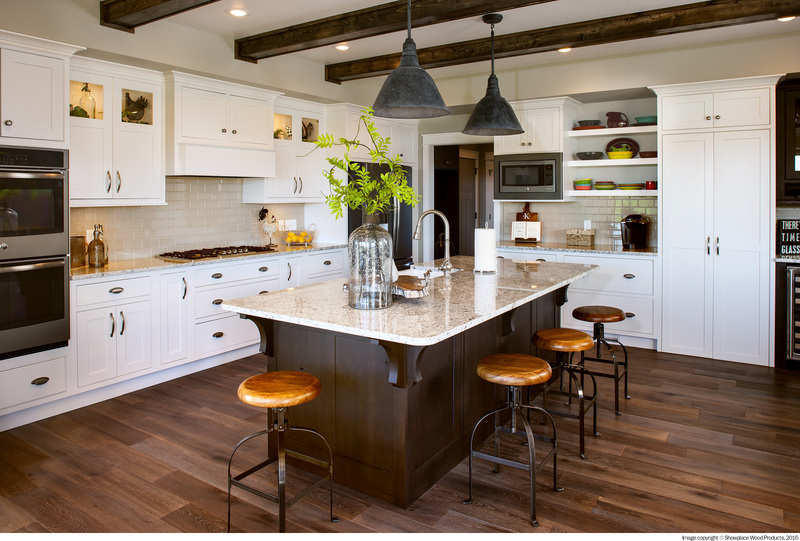 For example, we could two-tone a kitchen with white painted cabinets on the perimeter and stained cabinets in the island. The best way to find finishes that work for you is to play around with the color palette and find colors that work for you. Our recommendation? Utilize neutral colors or a combination of color and a neutral color. Want to see some ways we two-tone? Continue reading below! 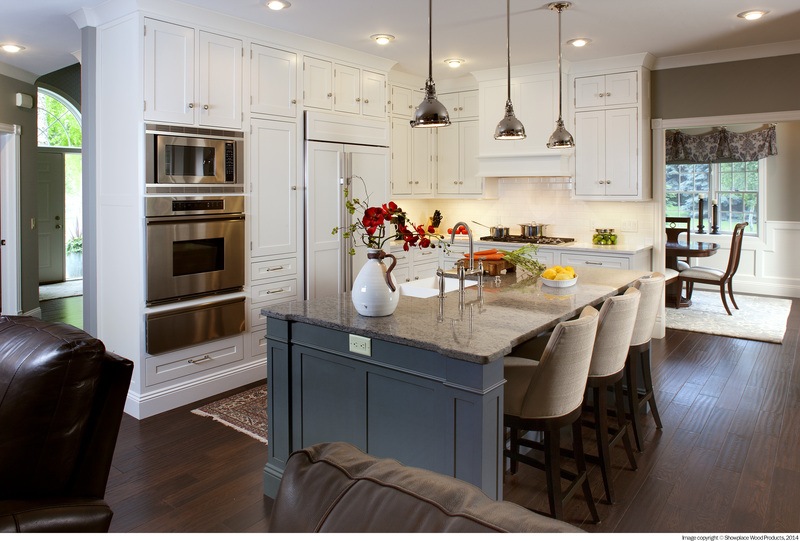 There are many ways to two-tone your kitchen cabinets. For example, we could design the upper cabinets with one finish, and the base cabinets a contrasting finish. We could even two-tone by highlighting the cooking area, such as the hood and cooktop cabinet, with a separate finish from the rest. There are many creative ways to incorporate a two-tone method, but the most popular method is the contrasting island method. It’s by far the most common way to two-tone! When it comes to two-toning, deciding on finishes and creating a nice color palette is important. We recommend two-toning with a palette of neutrals or a combination of neutral and a color selection. Having too much color, such as a blue perimeter and a green island would be off balance and just too much color. So, we believe it’s important to always have a neutral as a base, such as a white perimeter (neutral) and a blue painted island (color), for example. This allows the color to pop with a neutral background. You could even just stick to only neutrals such as combining white with a brown stain. Whichever one, both create a beautiful contrast. We love working with color palettes and creating designs our clients will love. We’ve designed many two-tone kitchens in the past and have a few go-to favorite combinations. Today, people love utilizing greys, stains, and blue color tones. That’s why we love combining whites with a stain, a grey, or a bolder color. Check out our favorites below! Two-toning your kitchen cabinets is a fun and exciting way to add visual interest to your space. Curious about how a two-tone method would work in your kitchen? Speak to our design team for more information as we can create a design that works for you! Contact us here !